A portable elemental altar and journal to record your spells, dreams and travels. Included: a warm wooden inlaid tray, five elemental tea light holders with high sides to stay lit, a leather-bound journal emblazoned with the compass rose to symbolize finding your own path, and a feather quill and ink set handmade in Italy, making writing itself an experience to remember. The green Celtic altar cloth doubles as a bag that carries it all for a quick trip into the woods, out to the beach, or to the brink of a nearby volcano. We hope the winner loves this as much as we loved building it! Retail Value: $100.00. We have created this giant herbal basket full of magickal, medicinal, and culinary herbs for PAGAN PRIDE RALEIGH! We have added a few of our teas and some goodies in-between. The value of this wonderful herbal basket is over $200.00 retail! Mountain Rose Herbs is one of my vendors and they graciously donated some herbs and a wonderful poster for you to win. We will also be giving a $25.00 gift certificate for our store! Cloak Alley creates out of this world capes and cloaks! Truely Unique is proud to carry her designs. She can design and create your own special cape. Itty Bitty Witch Cthulhu is ready to go home with you! This little Cthulhu features his own witch's hat and sits on a 1" wooden base. Both of these handcrafted items are made from 100% soft cotton flannel and come with ribbon for hanging! Win A 30-Minute Tarot Reading! Diana Payne has come to offer her gift of reading these signs. She has been involved with Metaphysics for over 42 years: an accomplished Astrologer (Western), Tarot Reader, Numerologist, and Mythologist. Involved with the Mind Sciences and Conscious Creation, she weaves her experience of Life’s symbols to help guide others to understand themselves and their lives. In understanding ourselves, we then open up to understanding others the dynamics at play and the objective opportunity to choose consciously. She believes that all we are doing is waking up to our magnificence, understanding the gifts that Life gave us, to flourish, to share it with one another in the realization that Heaven is on Earth! Medium length and size fully-lined cloak, with renaissance-style hood. Sourwood is one of the more common trees in North Carolina's lowland forests. Despite often forming cracks along the length of dried saplings, this fibrous wood is one of the strongest and most impact-resistant we have, second only to Hickory in balancing flexibility with strength. Levi prefers it above all others for carving practice swords. It is a good "conduit" for focusing Energy through physical motions, and will gradually meld itself to match the intent with which it is used. A two-sided pendant crafted of Sterling Silver wire, tourmaline quartz, lapis lazuli, and amethyst. I use all natural ingredients in the products I make. Products are alcohol free, using therapeutic grade Healing Arts Essential oils. Enjoy free tuition for the Nascent Magician magickal correspondence course! 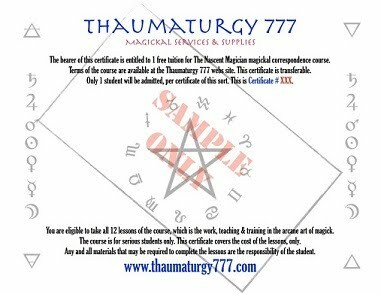 Terms of the course are available at the Thaumaturgy 777 website. 12 Lessons - provided to you in .pdf format, each 50 to 75 pages in length. Access to the private forum. Take part in the NM Study Groups at the shop, in Durham, NC. The course is for serious students only. This certificate is transferable. Measuring 17.5 inches (from top to pentacle charm), this pagan rosary features genuine purple amethyst stones and black jasper round beads in symbolic patterns of threes and fours. The clasp-less rosary is perfect for metaphysical properties related to spirituality, psychic abilities, and centering. Wear this pagan/Wiccan rosary proudly and use it daily to connect spirit to the divine with the power of prayer! Rest easily with the handmade dream pillow, stuffed with herbs, non-allergenic Polyfil, and petition charged for restful slumber. A 3.25 inch pentacle dream catcher features unakite and natural lava beads, perfect for cleansing and balance. Plus, you will receive a 1 oz jar of my own "Fortune Teller" herb blend, a great tool for rituals and spells! A majestic purple hat adorned with flowers, sparkles and a spider. Adorn your altar or even your kitchen table with this cute piece! This dashing little witch hat fascinator is just the thing to add to your outfit! This vibrant little hat is handmade by us at Yarn Twisters, and it comes ready to wear, complete with built-in clip! We also offer an assortment of other hand knitted and crocheted items. 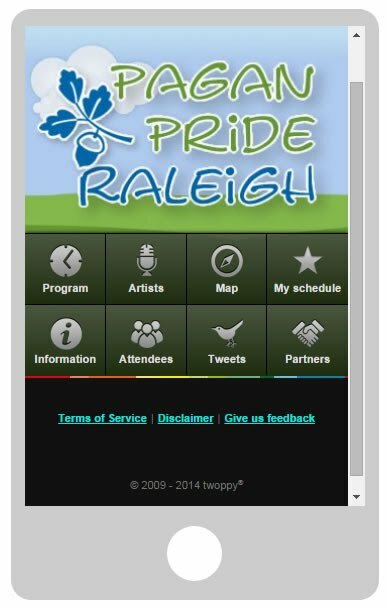 Visit our booth to see more!